Solar-powered LED outdoor area lighting is economically illuminating walkways at the U.S. Marine Corps Air Station Miramar in San Diego. The lighting system relies on off-grid solar power. Solar-powered LED outdoor area lighting keeps walkways well-lit at the U.S. Marine Corps Air Station Miramar (MCAS Miramar) in San Diego. Fixtures on a total of 143 light poles have been installed in the project. The lights provide outdoor area and walkway illumination. Low-profile, remotely placed, ground-mounted solar panels from Stuart, Fla.-based SEPCO, Solar Electric Power Co., were connected to existing light poles in the retrofit. The light fixtures are in an air station area known by the historic name as Bachelor Enlisted Quarters (BEQ). Long-life, low maintenance white-light luminaires were installed on the poles. The LED bulbs save hundreds of maintenance-staff hours because they need to be replaced less often than the 150-watt high-pressure sodium lights that had been on the tops of the poles. LEDs typically have a 60,000-hour or greater rated lamp life, according to the company. The newly installed luminaires (photo below on left) contain LED optics that consume 18 watts each instead of 180 watts that the old bulbs consumed. The new fixtures rely on no-cost, off-grid solar power. 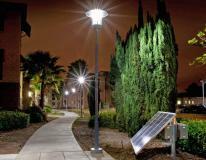 The all-solar LED outdoor lighting consumes no electrical grid power. The retrofit has enabled MCAS Miramar to meet Federal Energy Policy Act requirements for materially reduced energy use. 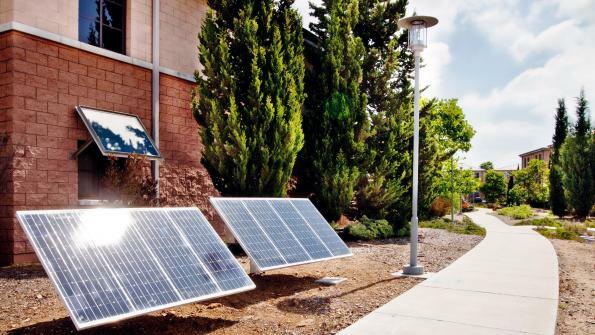 One SEPCO ground-level solar-panel array is needed to operate up to four individual luminaires. Electrical-generation or power-distribution interruptions don’t affect the solar units. The solar-powered LED fixtures operate on dusk-to-dawn through solar panel sensing. The white-light luminaires deliver illumination instantly. The fixtures offer high visual acuity and pleasing illumination for pedestrians and motorists. Electrical conduits and wiring for the new solar luminaires are all underground. This helps enhance aesthetics throughout and adjacent to the BEQ area of Miramar. The new luminaires employ an eye-catching transitional lighthead design. The new look is reminiscent of classic, early 20th century outdoor fixture designs. The video spotlights SEPCO, Solar Electric Power Co. The firm has been producing outdoor solar lighting for over 20 years. The firm’s products illuminate streets, roadways, parking lots, pathways, parks, signs and bus shelters. Clean, renewable solar energy powers the firm’s products.